You are probably on this page because you want to learn more about the various games and puzzles available on the “Cool Math” website! We have taken the time to investigate dozens of math websites and games to help you find the most useful and educational titles as quickly as possible! 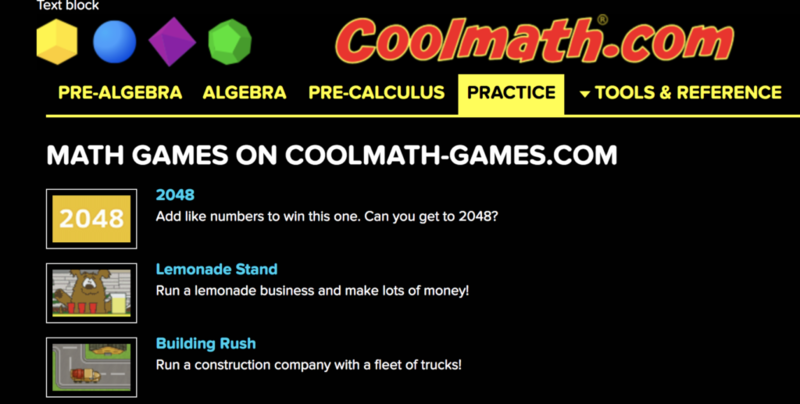 In this particular article, we’ll be taking a look at the popular, “Cool Math Website,” which is actually one of the three websites in the Cool Math Games network! In case you want to check out the other two “Cool Math Games” websites, we have provided a summary of each and links to our in-depth reviews! Please note, although this website says math… there is very little math on this site. This is a brain-training site for everyone, where logic & thinking meet fun & games. These games have no violence, no empty action, just a lot of challenges that will make you forget you’re getting a mental workout! If you are looking for an educational website with a stronger focus on the common core math standards, we suggest you check out Math Playground. 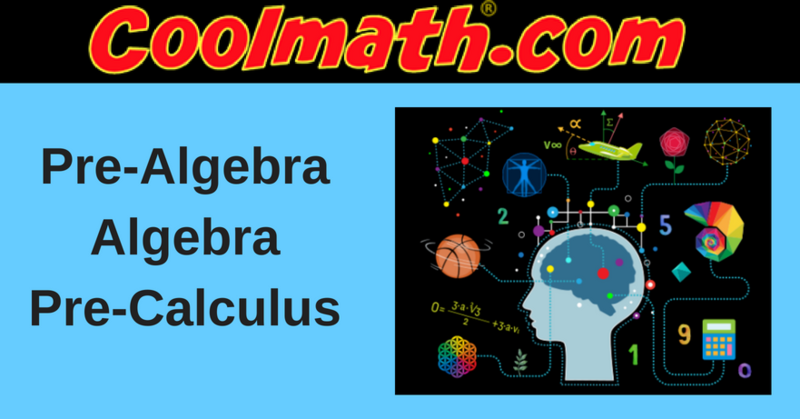 This website is best for students aged 13+ and includes explanations that are easy to grasp, on topics like: algebra, pre-calculus, and more. Although it doesn’t have as many games, the formulas, videos, and tools are great resources for teenagers! This math website is best suited for students aged 12 and under. “Cool Math 4 Kids” is an amusement park of math, games, and more. It’s designed to teach math and make it FUN. Although it’s still not as curriculum focused as Math Playground, this website provides excellent educational resources for students and teachers in the K – 7th-grade range. Now that you have a general overview of the three websites, let’s dive into website #2, “Cool Math,” in more depth. Cool Math was the first of the three websites, and at this time it’s the only one that is actually useful for teenagers. This website covers a variety of math topics that teenagers tend to struggle on, such as: Pre-Algebra, Algebra, and Pre-Calculus. The general flow of each page is: Subject > Topic > Sub-Topic > Lesson; in a slideshow format. On the tools & references page, you can find a ton of helpful resources including the math dictionary, math survival guide, geometry references, puzzles, and a teacher success area. However, the practice section is a complete waste of time and contains elementary games from their Cool Math Website… which has very little to do with math. One thing I particularly enjoyed was the “Math Survival Guide,” which you will find more details below. Ok… Now, let’s dive into the five primary navigation sections to better understand how to navigate quickly and make the most of your time on this website. Jump to the end of the article to see what sections we believe are the best for students… and which ones are just a waste of time! After navigating to one of they main topics, such as “Intro to Fractions,” you are brought to a series of sub-topics that help students further master the topic. After you select one of the sub-topics, you are then brought to a slide deck… kind of like a power-point presentation or online course that explains the sub-topic in more detail. To the right, is a navigation bar that shows what sub-topic you are currently working on, and which one is up next. Check out the gif below to get a better idea of how teachers and students can use these tools to master Pre-Algebra! After you select one of the main topics, such as “Polynomials,” you are brought to a series of sub-topics to help you master the topic. TIP: You can find additional examples at the bottom of the page! Just like in the pre-algebra section, once you’ve selected one of the sub-topics, you are then brought to a slideshow presentation that explains the sub-topic in more detail. Check out the gif below to get a better idea of how teachers and students can use these tools to master Algebra! The Pre-Calculus section is a bit different than the Pre-Algebra and Algebra sections. First, there is no subtopics like the other two sections. Instead, the topics jump straight to the material. Secondly, there are also additional useful tools that are included on the right side of the main page, which covers a variety of equations and will definitely come in handy! After you click on one of the popular topics, such as “Slopes of Lines,” you are NOT brought to sub-topics, like in the Pre-Algebra or Algebra section. Instead, you are immediately brought to the lesson. Check out the gif below to get a better idea of the layout, and how teachers and students can use these tool to help master Pre-Calculus. Here I was on a site designed to help teenagers with math, then suddenly, I am shown a bunch of elementary games from their website Cool Math Games! None of the content here is applicable for teenagers. My experience with website SEO leads me to believe that the only reason they are linking out to this content is for SEO purposes and to help their other website get more search traffic from Google. If you have an elementary level student, you may find some of the content on Cool Math Games useful. However, I would still recommend you go to Math Playground, where you’ll find games with a stronger focus on education. This section has five different sub-sections. 1.Math Dictionary: This resource is quite useful! You have a letter bank, and you click a letter based on the word you are searching for. For example, if you are looking for exponents, you will click on “E” and then you would be given a variety of math mathematics words that began with “E” including “exponent.” By clicking on the word you find the definition. 2. Math Survival Guide: This resource is pretty interesting. It provides small stories in a written format and is designed to help motivate your student to success! For example, I liked the “Do You Want to be Successful?” section. “Do you really want to be successful? I’m not talking about just being successful in your math classes. I’m talking about being successful IN EVERYTHING! After reading the story, I felt a little more motivated myself! This is my favorite part of the entire website. I think teachers and parents should consider printing out these resources for their students to get their teens motivated! 3. Geometry & Trig Reference: This is another excellent resource for students in Geometry. It contains every single equation you may need to be successful in Geometry. Below, you’ll see an image of a handful of examples to give you a better idea. 4. Puzzles: This is another resource that is out of place. Random online jigsaw puzzles that students can make that comes straight from their other website, Cool Math Games. 5. Teacher’s Success Area: Here the company provides helpful resources for teachers. After reviewing, I like the two books they recommend teachers to read. How People Learn: Brain, Mind, Experience, and School. Overall, the practice section is a complete waste of time and only on their website for marketing purposes… The tools & resources, on the other hand, have some great value! I particularly liked the “Math Survival Guide” under tools and resources the most. It helps to motivate students to want to be successful. Many times the reason students are not doing well in math is not that they can’t learn the material, but rather is because they don’t have the motivation to want to! There are dozens of free math resources like this on the web that students can use to master these math facts. First, however, they have to be motivated! Finally, if you want great math instructional resources I suggest you check out my article, Top 10 Math Websites. What did you think of this review? Did I miss anything? What challenges is your student(s) having with math?